The Quinnipiac Bobcats limped into the end of the first half of the season with four losses in their last five games including an embarrassing swept at the hands of Princeton, a consistent ECAC bottom feeder for a half a decade. The time off for the next three weeks could not have come at a better time for Quinnipiac as they need to regroup and work to correct the issues that plagued them towards the end of the first half of the season. With that said let's take a look at how some of the future Quinnipiac Bobcats did over this past week. 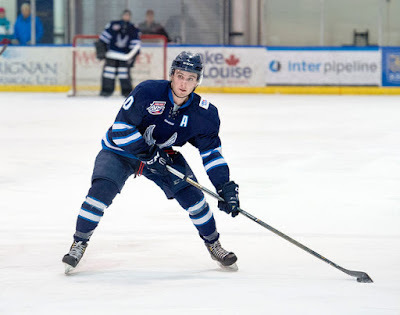 It was monster weekend for 1996 forward Matt Forchuk of the Canmore Eagles (AJHL). He retook the league scoring lead from his teammate with an eight point weekend (2 goals and 6 assists). He had a multi goal game Friday and on Saturday exploded for a five assist game. Forchuk now has 46 points (15 goals and 31 assists) to lead the league in scoring. He had missed the Eagles last three games prior to this weekend due to undisclosed reasons. 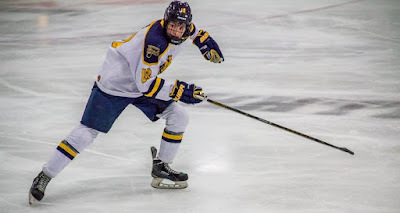 Another player who returned to the lineup after missing the last two games for his team was 1999 forward Matt Cassidy who had very good weekend with two multi-point games. On Friday he had a goal and an assist in the Springfield Jr. Blues (NAHL) 3-2 win. On Saturday he had two goals in Springfield's 5-3 victory. Five out of his last six games he has points with four of those games being multi-point games. In 24 games this season, Cassidy has seven goals and eight assists but has been really been more comfortable in the last month and it has showed on the stat sheet. It was good week for 1998 forward Khristian Acosta who had a goal and three assists in four games played. He had a goal and an assist in Wednesday's game against the New Jersey Titans. He also had two assists in three games over the weekend. He has had points in seven of his last nine games for the Wilkes-Barre/Scranton Knights (NAHL). In 20 games this season he has 22 points (7 goals and 15 assists). 1998 forward John DeRoche had two more assists this weekend for the Topeka RoadRunners (NAHL) as his team split a weekend series against Amarillo. In nine games for Topeka, DeRoche has 10 points (4 goals and 6 assists). He is averaging 1.11 points per game since moving to the NAHL from Cedar Rapids (USHL). Fargo Force (USHL) 1997 forward Odeen Tufto came up clutch this past weekend with two goals and an assist along with a shoot-out winning goal for the Force on Saturday against the Chicago Steel. In 23 games this year he has only 14 points (4 goals and 10 assists). While he is statistically not on last years pace when he was in the BCHL, it was expected he was not going to produce like he did a season ago once he moved to a better league. Tufto needs to be commended for challenging himself by moving to the USHL against better competition this season which will prepare him for his arrival to Hamden in the fall of 2017. Muskegon Lumberjacks (USHL) 1999 goaltender Keith Petruzzelli picked up two wins this past week. He saved 51 of 57 chances in two games for the Lumberjacks. In 16 games played he is 9-5 with a 2.56 goals against average and a .913 save percentage. 1999 forward Corey Clifton has 7 points (2 goals and 5 assists) for Christian Brothers Academy (NJ) in five games played this year. Clifton is also playing for the North Jersey Avalanche 18U team. 1997 forward Matt Creamer had a two point week. He had a goal and an assist in three games played. In 33 games this season he has 18 points (10 goals and 8 assists). Creamer has had points in four of his last five games for the Nanaimo Clippers (BCHL). 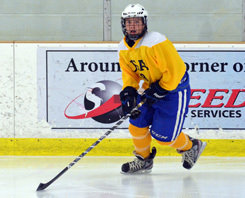 It was another multi-point weekend for 2002 forward Jacob Quillan. He had a goal and an assist in two games this weekend. He has a point in five straight games for the Steele Subaru Major Midgets along with points in eight of his last ten games. In 21 games played he has 14 points (4 goals and 14 assists) which is 7th on the team in scoring for the youngest player on the team.